Matches for week 14 of the Nigerian Premier League took place over the weekend, we had 7 home wins and 3 draws with no away win recorded. League leaders Lobi Stars went 3 points clear at the top of the log with 26 points after a hard fought 3-2 win over Rivers United on Sunday evening in Markudi. Lobi Stars Vs Rivers United: Lobi Stars took the lead in the 19th minute through a penalty coolly converted by Ezekiel Mba. Lobi Stars, however, went to sleep after the goal by conceding two goals in a space nine minutes to go 2-1 down at halftime. Striker Austin Ogunye came to Lobi Stars rescue in the second half by scoring a brace with his second goal and Lobi’s third coming in added time through a penalty. Lobi Stars claimed all three points with a tight 3-2 victory over hard fighting Rivers United who left Markudi empty-handed. Akwa United Vs Abia Warriors: Second place Akwa United came from behind to force visiting Abia Warriors to a 1-1 draw at the Godswill Akpabio International stadium in Uyo. Abia warriors took the lead in the 75th minute through a well-taken goal scored by Obi Samson and Akwa United fought back to level the scores at 1-1 through Dumte Christian Pyagbara in the 83rd minute. The match ended one apiece in Uyo leaving Akwa united three points adrift of league leaders Lobi stars but with two games in hand. Kwara United Vs Kano Pillars: In Ilorin, Junior Lokosa scored his twelfth goal of the season to hand visiting Kano Pillars the lead in the 28th minute, the Afonja warriors showed some fighting spirit by equalising in the 65th minute through Sunday Udechukwu and five minutes later, Kwara United got the winning goal through Lookman Binuyo in the 70th minute. The win was just the fourth for Kwara United this season, they stay rooted to the bottom of the table with 14 points and a game in hand while Kano Pillars remains in the third position with 21 points and 5 points behind League leaders Lobi Stars. Ifeanyi Uba Vs Plateau United: Reigning League Champions Plateau United was humbled 3-0 by Ifeanyi Uba in Nnewi, Kone Yaya Soumaila was the hero of the Nnewi based team as he bagged a hattrick to inflict a sixth defeat of the season on Plateau United. The win took Ifeanyi Uba to 11th on the log with 18 points while Plateau United is 10th just one spot above Ifeanyi Uba on goal difference. Kennedy Boboye and his boys must get their acts together before their crucial continental dual against U.S.M Alger early next month. Yobe Desert Stars Vs Enyimba FC: Enyimba took a 5th minute lead in Damaturu through Mustapha Ibrahim, the host battled hard and were rewarded in the 59th minute through Phillip Auta who converted a penalty awarded to Yobe Desert Stars. The draw moved Yobe Desert Stars to 4th on the log with 20 points while Enyimba is 12th with 18 points and they have two outstanding games at home to both MFM and Go Round. Go Round Vs Rangers International: In Omuku, Go Round came from two goals down to force visiting Ranges International of Enugu to a pulsating 2-2 draw, Rangers went into halftime break two goals up through a brace scored by Ifeanyi George in the 7th and 23rd minute. Go Round pulled one goal back in the 62nd minute through Eta Okon Otop, they, however, left the equaliser late until the 90th minute when Chile Azu converted a late penalty to rescue his team from an embarrassing defeat at home. 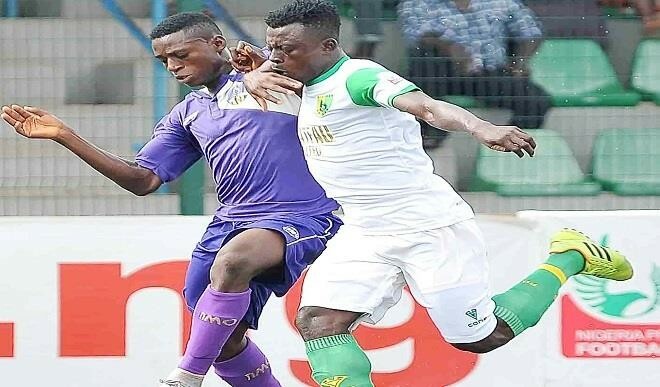 MFM FC Vs Katsina United: At the Agege Stadium, the Olukoya boys came from behind to earn a 2-1 victory against visiting Katsina United through a brace scored by Chijioke Akuneto who came off the bench to score for MFM. Heartland Vs Nasarawa United: Heartland managed to go past visiting Nasarawa United by 2-1 in Owerri, Heartland won the match courtesy of a brace by Macmarcel Obioha who scored two penalties with the second penalty coming late in added time. Wikki Tourist vs El Kanemi Warriors: Wikki Tourist of Bauchi romped to a 3-0 home win against their visiting Northern neighbours. Shammah Tanze scored a brace in the 48th and 61st minute to give Wikki Tourist their sixth win of the season so far. The win lifted Wikki Tourist to 9th on the League table with 19 points, while El Kanemi Warriors is second from the bottom with 16 points from four wins and four draws this season. Niger Tornadoes Vs Sunshine Stars: In Minna, a 7th-minute early goal by Austin Igenepo John was the difference as Niger Tornadoes claimed their sixth win of the season and moved up to fifth on the log while Sunshine Stars who suffered their fifth defeat of the season is 18th on the league table. The next round of matches for Week 15 of the Nigerian Premier league comes up on the 1st of April, 2018.